When we last left our heroes, they had entered a cheat code to unlock the new Mega forms and gain a fighting chance against VenomMyotismon. We'll start with that, because it's worth putting perspective to this Warp Digivolving thing, especially after several seasons worth of insane game-breaking evolution types. Compared to the madness of Susanoomon and everything they end up throwing at us in Xros Wars, Warp Evolution seems pretty basic. It adds a sixth level, Mega, to the list and works instantaneously from the Rookie level. Both of these are huge deals. Astute listeners may have noticed that Ultimate level Digimon had been referred to as “fully evolved,” implying that they could go no further. Well... just kidding! Izzy's shock that VenomMyotismon was at a scale above Ultimate demonstrates just how much this Mega level changed the game. Why does it matter? Despite jumping from five to six different levels in season one, this number never goes up again. 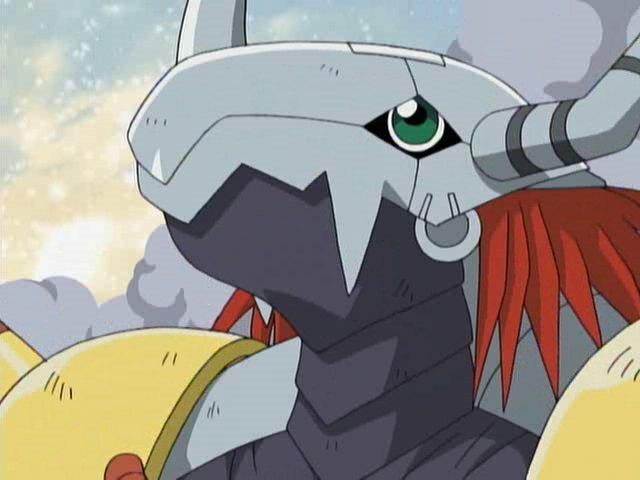 No matter how much stronger Digimon get in the next few seasons, everything continues to get shoe-horned into Mega Level. In fact, rather than go higher than Mega, folks like Imperialdramon, Gallantmon and the Data Squad team get additional modes instead. That's how sacred Mega level is. At least until Xros Wars when they rewrite the process from scratch. Bypassing the Champion and Ultimate levels along the way is a big deal as well, as it changes the way battles are conducted. Instead of going to Champion and then Ultimate when an extra push is needed, now Tai and Matt can just push the Win button from the get-go. This too sets an important precedent as it's repeated elsewhere, most notably with Bio-Merging in Tamers. The other big change is that by giving this power exclusively to Agumon and Gabumon, the notion of the ensemble cast is shaken considerably. Now two of the kids are on a different level than the others. While Adventure writes around this pretty nicely, it leads other seasons into a brick wall. I'm looking at you, Frontier. Once WarGreymon and MetalGarurumon arrive, the actual battle feels like mop-up work. There's certainly plenty of tension and a nice sequence where the sides go back and forth without a clear winner, but it's pretty short. 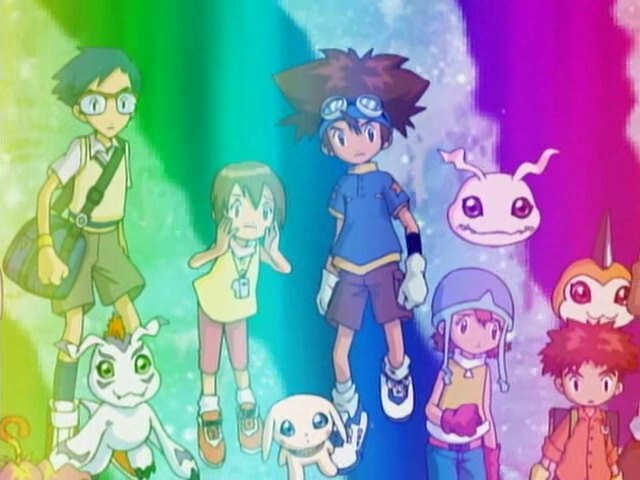 There's a good moment where Sora, Mimi, Joe and Izzy each decide to jump in with their puny little Champions. The climactic sequence is sweet too: the group collectively weaken VenomMyotismon's torso so WarGreymon can drill through it. This opens up what is apparently yet another form (some sort of stubborn crotch monster), but the digivices restrain VenomMyotismon and WarGreymon finishes it off by first kicking the “ball” from the TV station at it, then delivering his Terra Force attack, which is just about the most badass thing ever. But we're not through yet! As the children celebrate amid the rubble and destruction of what used to be Odaiba and their families start to wake up, the fog opens and reveals more trouble. The Digital World is looming overhead, and has tangible effects on the real world as planes flying too close encounter a systems failure and start plummeting. 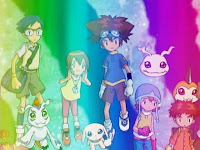 Satellite reception is suddenly shaky and images of Digimon appear all over the world. Izzy realizes that in the few days that have past since they left, the Digital World has advanced by countless years and probably has some serious problems now. At least this time, they get to say goodbye to their families, who have no choice but to watch them float up and return to imminent danger once more. I understand that other media have another level called Super Ultimate that Susanoomon and a few others have been retconned into, but we're dealing primarily with the anime here, which is determined to top out at Mega, no matter how insane it gets. Hiroaki Ishida Watch! This episode, he flips a truck in such a way that, despite having several passengers, only Izzy's dad shows any hint of an injury. He also defies the network censors and lights up a cigarette as his ex-wife arrives. He mostly ignores her, except when he tells her to stop whining and let them go. On that note, while TK's absolutely elated that the whole family's together again, Matt is incredibly cold to his mother, which she doesn't appreciate. While Garudamon and Kabuterimon help save one plane from going down, we also saw a military plane losing power earlier in the episode. It's never seen again. Condolences to the families of its crew, apparently. Funny how even when Joe gives a passionate speech of his determination to save the world, Sora and Mimi are still able to emasculate him simply by pretending to swoon. Its interesting that when the kids leave, they are all choked up about it, but our resident crybaby TK is upbeat and giggling. Its like role reversal or something. It's downplayed, but I think it's significant that the kids chose to go back to the digital world now that they're finally home. I guess they didn't really have a choice, but they've matured to the point where they actually care about the digital world for its own sake, too. Deja vu from the Etemon final battle that Tai is the only one to not psychologically cave and is thus the first to activate glow power. 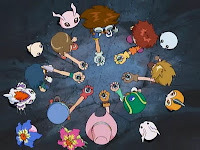 It's corny, but I like the emotional-resolve-turned-power aspect of Digimon. And it's an attribute that all the goggle-head possess in Spades. I just recently watched the sub and i noticed Hiroaki Ishida is voiced by Hiroaki Hirata, who also voices Sanji in One Piece. So him lighting up a cigarette doesn't seem so random now, at least to me lol.